I love when someone you knows reads a book which makes them think of you and in turn sends you a copy as a gift. This has happened a few times to me over the years and it is always special. Recently, I was thrilled to receive a copy of An Everlasting Meal: Cooking with Economy and Grace by Tamar Adler from my good friend Lynda. Lynda had mentioned the book to me and at first I was a little dubious about why she thought of me when she read it, but once I threw myself into it, I knew exactly what she saw. An Everlasting Meal is part cookbook, part memoir and overall an intimate collection of essay about food from a passionate cook. More than anything, Ms. Adler makes even the most basic things about cooking interesting and entertaining. I have always been a creative and fearless cook – one who is not afraid to experiment and try new and creative things. Likewise, in An Everlasting Meal, Ms. Adler shares tales of making creative dishes out of things she finds in the cupboard and trying new things. An Everlasting Meal: Cooking with Economy and Grace is the type of book you can pick up and read sections without feeling you need to finish the whole thing. Each time you pick it up, I am confident you will be entertained and inspired in your everyday cooking. 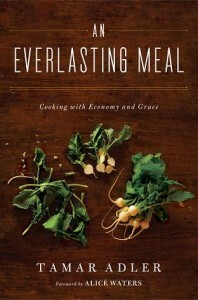 An Everlasting Meal: Cooking with Economy and Grace is available from Amazon and other fine retailers. Lost Cowboy is powered by	WordPress 5.0.4 and delivered to you in 0.760 seconds using 40 queries.